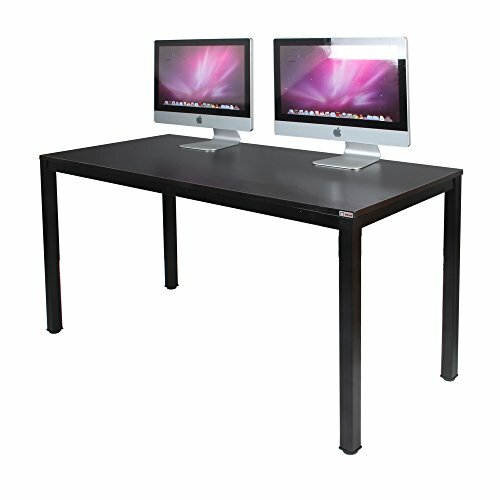 The Need large size computer desk which is 63 inch length offers a spacious and efficient workplace for your home or office. Enjoy a beautiful traditional look with smart features for your convenience. The simple square design provides a large durable work surface and just the right amount of storage to keep you feeling neat and organized. With the large size, it is perfect to use as a meeting table, conference table, working desk etc. The computer desk quality construction meets ANSI/BIFMA test standards for safety and performance. A rich glossy finish provides a simple, elegant and timeless appearance for using. Computer desk size: L63" * W23.7" * H29.5", 63" long provides ample desktop space for computer, monitor or printer etc;provides large working space. High Stability : metal frame are all in 1.2mm thick, which is 1.3 times thicker than ordinary 0.8mm ones, and able to better stablize the desk more than usual with heavy weights. Certification: our desk is certified with "BIFMA", accorded with US office furniture standard. If your item arrives damaged, broken, scratched, or dented, we will send you a replacement or give you a partial refund, please be assured to purchase.